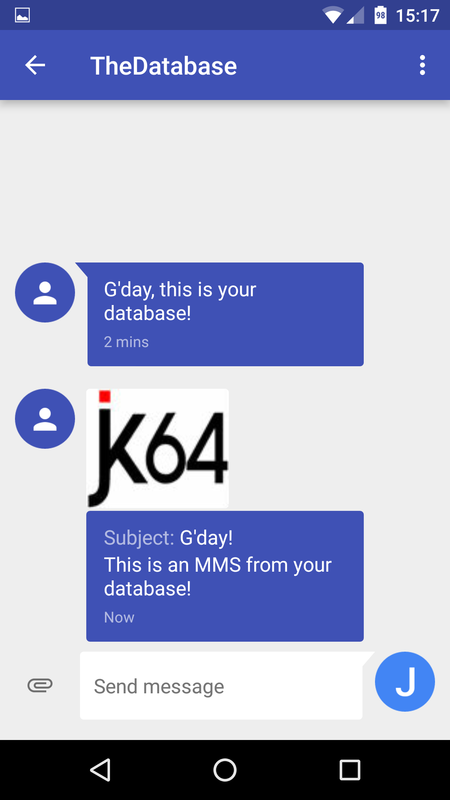 If you need to send almost any message to almost any phone from your Oracle database, and you want to use straight PL/SQL, you may want to consider using my Clicksend API. All you need to do is signup for a Clicksend account. You’ll only be charged for messages actually sent, but they do require you to pay in advance – e.g. $20 gets you about 300 messages (Australian numbers). You can get test settings so that you can try it out for free. I’ve been using Clicksend for years now, and have been satisfied with their service and the speed and reliability of getting messages to people’s mobiles. When I encountered any issues, a chat with their support quickly resolved them, and they were quick to offer free credits when things weren’t working out as expected. If you want to send a photo to someone’s phone via MMS (although I’m not sure what the use-case for this might be), you need to first upload the image somewhere online, because the API only accepts a URL. In my case, I would use the Amazon S3 API from the Alexandria PL/SQL Library, then pass the generated URL to the clicksend API. There is a file upload feature that ClickSend provides, I plan to add an API call to take advantage of this which will make this seamless – and provide some file conversion capabilities as well. You can send a voice message to someone (e.g. if they don’t have a mobile phone) using the Text to Voice API. You have to tell the API what language the message is in. For a number of languages, you can specify the accent/dialect (e.g. American English, British English, or Aussie) and gender (male or female). You can see the full list here. All calls to the send_sms, send_mms and send_voice procedures use Oracle AQ to make the messages transactional. It’s up to you to either COMMIT or ROLLBACK, which determines whether the message is actually sent or not. All messages go into a single queue. You can have a message be scheduled at a particular point in time by setting the p_schedule_dt parameter. The default installation creates a job that runs every 5 minutes to push the queue. You can also call push_queue directly in your code after calling a send_xxx procedure. This creates a job to push the queue as well, so it won’t interfere with your transaction. All messages get logged in a table, clicksend_msg_log. The log includes a column clicksend_cost which allows you to monitor your costs. To check your account balance, call get_credit_balance. Please try it out if you can and let me know of any issues or suggestions for improvement.